Every proud American knows the words to the Star-Spangled Banner by heart. Help your 2nd graders learn them too with the help of JumpStart’s ‘Star-Spangled Banner’ – a free and printable national anthem worksheet for kids. This worksheet has been especially designed to help kids in second grade memorize the first stanza of our national anthem. Help your kids learn more about her country as well as practice her spelling and writing skills on the occasion of this year’s Independence Day. 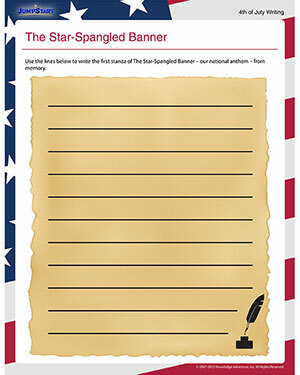 Introduce her to this beautiful Star-Spangled Banner worksheet for kids. Also browse through our other exciting 4th of July worksheets.